Book Bus Raj gets to work. That’s what happened yesterday when our Book Bus team arrived at ROC school in Kitwe, Zambia. 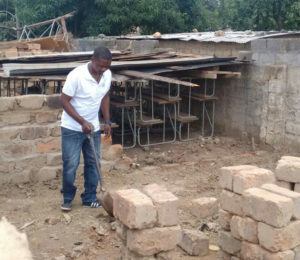 The rains had been so heavy that it had washed away the main school building. Un-phased our local team, Monica, Raj and Bwalya, rolled up their sleeves and set to work helping the local community rebuild the classroom. ROC school is a community school that the Book Bus has been visiting in 2015 and is part of our 2016 programme. It provides education to children from the surrounding improvised area. 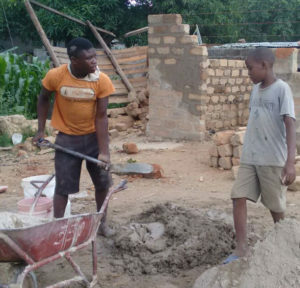 Many of the children would not attend school if ROC school wasn’t there so it was crucial to get the school classroom rebuilt before the next rains arrived. Former pupil Bryson helps out. Everyone in the community chips in to do their bit including formal pupil Bryson who is the only young person in the area to make it to secondary school. “It was a bit of a shock when we arrived to see the devastation to the school. We knew we needed to help, so we parked Book Bus George and set to help the community rebuild the school,” said Book Bus Reading Champion, Bwalya Chimba. 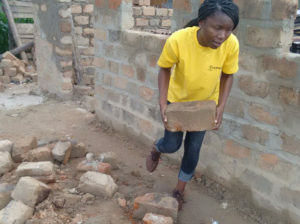 Bwalya swaps books for bricks for a day. “This community really understands that importance of education so set to work to get the school back up and running. We’ll be back running our Book Bus reading sessions as soon as we can,” said Bwalya. “The children love the Book Bus sessions and we want to ensure we continue to help them develop a love of reading,” concludes Bwalya as she swaps bricks for books with the rest of the school community. Want to help with a donation?